Recently, we had a chance to talk with our hero in a phone call to Spain, where they film the series. In his younger days, he was a heavyweight contender for the Canadian Olympic boxing team, but maintained a love of the arts, and is now one of the few Hollywood stars who is a serious and often-exhibited painter. His painting is a love which came over very strongly in our conversation. "How do you like playing Zorro?" "It's good fun. It's an interesting part. It's really two parts in one. 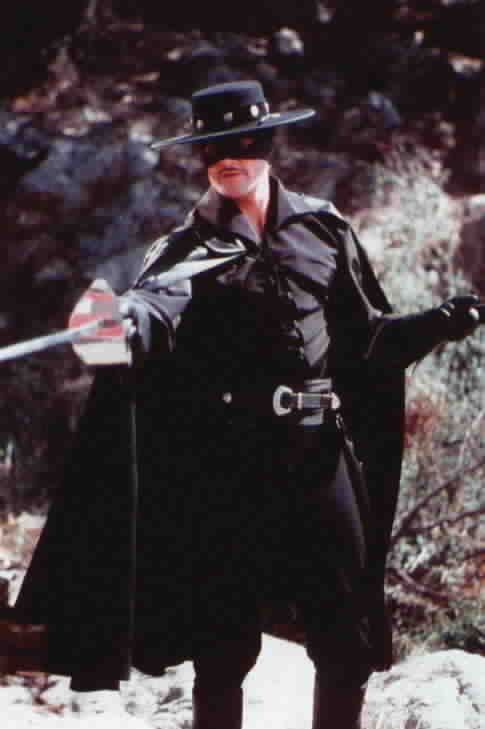 There's the Don Diego side of the character, and there's the Zorro side. One is the inactive sort of individual, very intellectual and sort of bookish, for lack of a better term, and the other side is the action hero, the guy that does all the fencing, and collects all the accolades." "So much of Zorro's character revolves around his use of the sword. . .did you start fencing in school, or did you begin before then?" "I started when I was at Stratford. I was trained by Patric Crane many years ago as part of the theatre there." "Was it actual fencing, or was it theatrical fencing?" "Well, it was more theatrical fencing. What I learned from him was pretty basic stage fencing, which doesn't really use a lot of fencing moves. 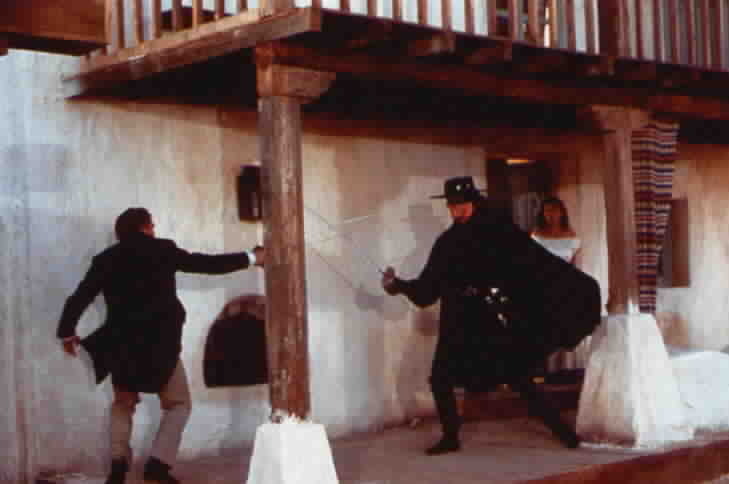 On the stage you have to use large sweeping spectacular sorts of moves, but once I began getting into films, like the role of Errol Flynn in "My Wicked Ways," "The Last Days Of Pompeii," and different sorts of swashbuckling movies, I started to develop, trying to incorporate actual fencing moves with the big stuff. You've got the sort of sabre-type moves, and then to make it interesting in contrast you move into something small, the very small type stuff that looks attractive on film." "Have you ever actually competed in fencing?" "Oh no, no, never. I mean I've always been a theatre man, a movie man. Although we had the Spanish Olympic team out last year, and used them in one episode that we did, and they said they couldn't believe how fast we did the moves. I think that episode was called "Master and Pupil." "That's the one where Peter Diamond comes back." "Yes. 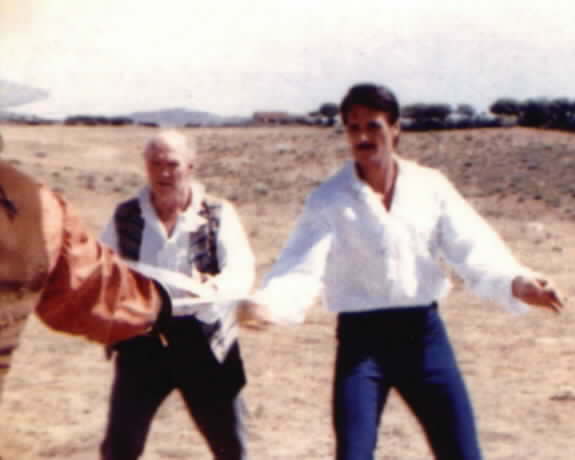 Peter is undoubtedly, I think, the greatest sword choreographer in the world for film, and theatre, today. He's absolutely the very best there is alive today. I don't know if he's in the credits, but he did all of the "Star Wars" trilogy. He's done absolutely marvelous stuff with actors that didn't even know how to fence." "Is a lack of fencing experience that common with actors today?" "I find that there are very, very few people that come out of schools today that really know how to fence for film. . .or for the stage, for that matter. They all have a certificate, but what happens for Peter and I, nine times out of ten, is, he ends up doubling on the guy that I'm supposed to fight with, or we just use his hand on the opponent's sword, against my own, so we get some sort of speed with it, but it's very difficult." "How did you like Hamlet in regards to the swordfights?" "Oh, it was okay. Again, it was a question of who's your opponent. 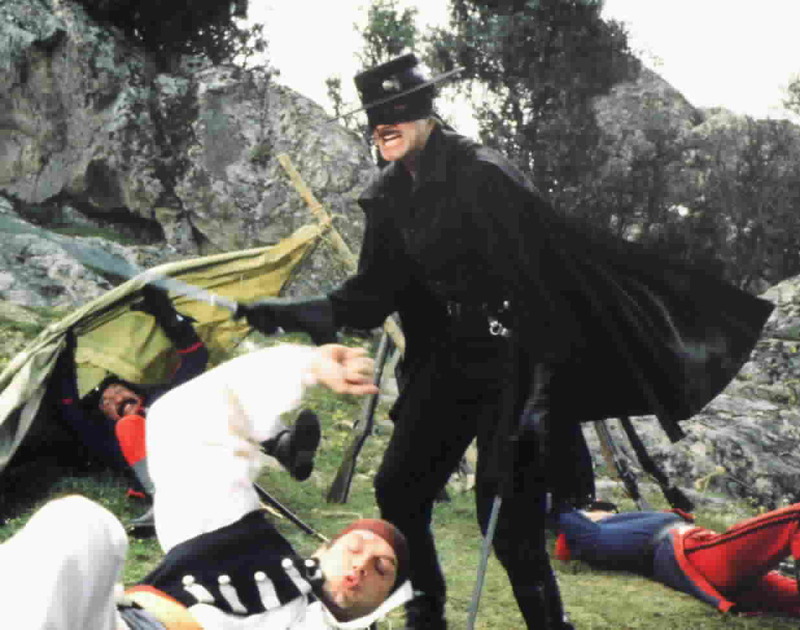 You're really only as good as your opponent in a lot of these things, which is why, on Zorro, we try to dress up the fight scenes with a lot of other things. I put in punches, and kicks, and crazy moves that, in reality, you would never really do, but they dress it out. . .they flesh it out and give it a nice look." "When you start training with Peter, how do you set up the stage? Do you have something in mind when you begin, or does he make up the action sequences as you go along?" "Well, of course we plan everything in advance so nobody gets hurt. Safety is obviously the number one thing. He usually comes in, and we look at the script to see what kind of a fight would be good for the scene. Next we look at what sort of moves we could do that might be a little different from the last fight. "Again, it depends on who your opponents are. If its just a group of soldiers, then they're obviously not going to give you a bunch of complicated moves. They're going to come in and sort of hack and slash at you, and you sort of have to dispatch them rather quickly. "On the other hand, if it's a major villain that comes to town, and has to be fairly adept at what he's doing, then we try to think up something new. Perhaps we'll try a different view on the whole scene, maybe fly different camera angles, or perhaps fly some different props. "It's very difficult to come up with new and interesting things, but with Peter's background of some 40 years in the film and theatre business he still manages to surprise me. He truly is the best. He's, I think, solely responsible for anything that I know that's any good at all. 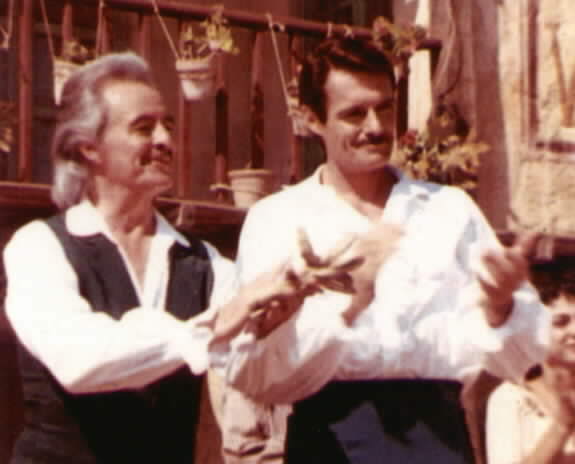 "We met years ago in a film that we did with Laurence Olivier in Italy, called 'The Last Days Of Pompeii.' Peter choreographed all the gladiator work that we did in the Colosseum, and we always said back then, 'Wouldn't it be nice to get together and really do a good fencing picture?' 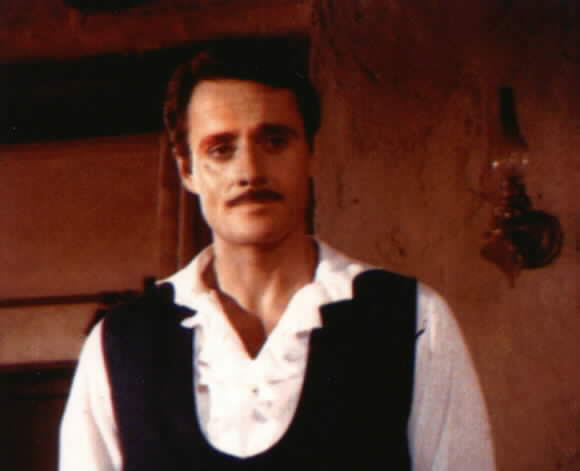 Well, almost ten years later I was asked if I would like to do Zorro, and I said, 'Yeah, but I will only do it if I can have Peter Diamond do all the choreography for me.' So we called him up, and Peter said, 'Great. . .let's do it,' and here we are three years later, and we're still doing it. It's been a lot of fun." "Does he train with you daily?" "No. . .no, I have my own style. I'm sure you probably noticed that it's not anything. . .well, the way Zorro stands, for instance, is particular to the character. We try to do the same thing with the fights. 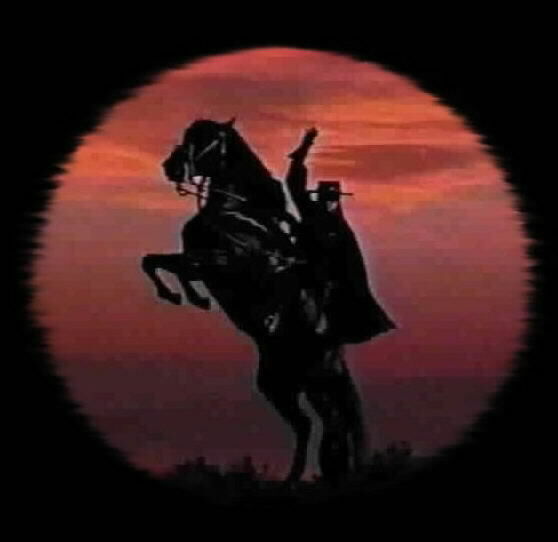 You have to make the actions within the fights for Zorro in tune with his character. Does that make sense? If he makes a particular move with the sword, it has to be a la Zorro. "It can't just be a sword move, it has to be the way he would do it himself. If somebody else took the same move, they would do it differently. "He's always swift, and he has an economy of movement, and the other thing is smoothness, I think, and. . .that's the ticket for him. Within that, Peter and I both understand that style, so we're of one mind when we go to choreograph something. We'll both sort of say, 'Yeah, that's a good move for him,' and it works." "Concerning the sword itself. . .in Disneyworld they have a little museum off to the side, just as you come in, and in it they have Guy Williams' sword, mask, hat, and cape. I was amazed to find his sword to only be a fencing sabre with an epee blade. There was absolutely nothing fancy to it at all. Your sword; is it similar?" "No. We use a special alloy on the blades so we can get some real flashing and speed out of it. There's a glint off of those blades that we try to get a nice strobe effect out of every once in awhile. If you get somebody moving along at just the right speed then there's a nice flash that happens, and that's from the metal itself. Everything is done for appearance. They are basically sabres, but not really. We had them custom-made for our needs. The blade is unique. You can't really say what it is. You just have to say, 'Well, it looks kind of like a sabre.'" "One of my students saw you in 'Wizards and Warriors,' and he's a real fan of this sort of story, so his question was, 'Which weapon do you prefer?' and this invokes everything from medieval to Zorro. That is, if you had a choice." "I've used so many different props it's hard to say. I mean, anything to do with a stick is a lot of fun. A stick can be a sword, or a staff, or a spear, or whatever you want to use it for. Just about anything you pick up can turn into a weapon if you know what to do with it." "I remember a rake in one of your episodes." "Yes, and it makes the scene interesting. Even a pencil works if you use it the right way." 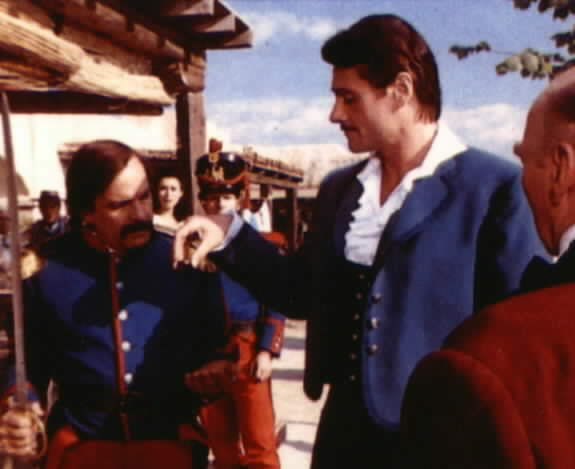 "Why did you decide to film the Zorro series in Spain?" "Well, a lot of it has to do with economics. It's much cheaper to shoot here in Madrid than in Los Angeles, and the terrain is exactly the same as it would have been in Los Angeles more than a hundred years ago." "Out of all the Zorros, other than your own character, which Zorro did you like best?" "Would you believe that I'm not really familiar with any of them? 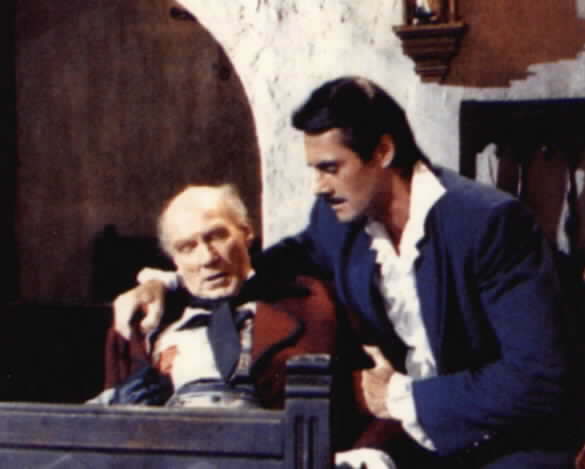 When we first started putting this together they told me they would come up with all the Guy Williams tapes that I wanted, and I told them don't bother, I'm going to come up with my own thing for it. I think I saw Douglas Fairbanks, Sr.'s Zorro. That's the very, very early film that he did years, and years ago. In fact, I've only seen one or two of my own, and that's it." "You don't care to watch yourself?" "I don't have time! I'm too busy making these things to watch them, and when I'm not working on this, I'm doing something else. I never watch television." "How do you feel about being in the shadows of so many other Zorros?" "I don't know. Hopefully I've got my own light on this one. Hopefully I'm doing something somewhat differently than what went before me. That's the only thing I can hope for." We said goodbye then. It had been a very good twenty minutes, or so, for me. Was I inspired? Yes. Did I go out into the back yard and hit my son with a stick? No. . .but I will be giving him sabre lessons in the near future.